Hostesses who hold a minimum $650 party during the promotion period will receive a FREE collection of Classic Stampin Pads*-they can choose from Brights, Subtles, or Regals. Plus, the free ink is in addition to the regular hostess benefits-INK-credible! I'm back from my jaunt in the USA, boy that's a looong flight back, very tiring, and therefore I'm still trying to get back into the swing of things. 1. 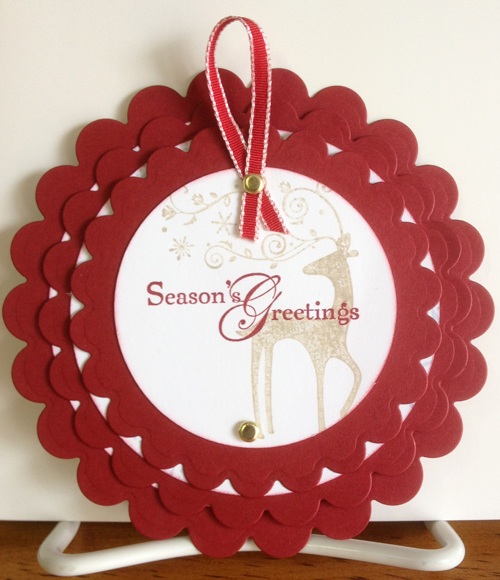 Stampin Up's October Promotion: "It's Spool Time!" Until October 31, for every $60 you spend on Stampin Up products from either catalogue, you may choose a spool of the gorgeous In Colour Stitched Satin ribbon for free! There are 5 colours to choose from: Summer Starfruit, Primrose Petals, Raspberry Ripple, Gumball Green and Midnight Muse. There are no limits, so you can get them all! Email me with your order or call me to work out what you would like to choose. I have all of them, so if you'd like to drop by to see them in real life then please give me a call. I'm a bit behind in this as I couldn't access everything while I was away (and I was on holidays, so really wanted to relax rather than work). I'll get onto this today so hopefully in the next few days you will start receiving the ideas - I have rather a LOT to choose from, so it will take a while to pick out the best 12 for you. What I'll do is work out the schedule, send you a few every couple of days to catch up, and then send the rest on the weekly basis of the original schedule. Another thing I want to send out this week, so keep an eye on your inbox for it. 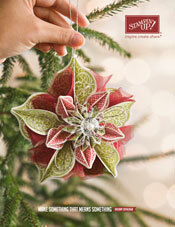 Do you want to make the fabulous Christmas Ornament on the front of the Holiday Catalogue? I'll be running classes on making it, with all materials supplies (BYO glues - check with me first if they are suitable). The first one will be held on Saturday 27th October, from 1pm. Cost is $25. As explained in my September newsletter, I'll be running shares of the ribbons and embellishments in the Holiday and Annual catalogues, so that you can get useable selections of all the ribbons and embellishments without having to buy whole spools or packets. Email or call me if you would like to join in. 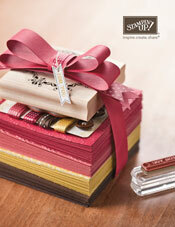 Do you love all of the embellishments and ribbons, but don’t want to buy whole rolls or packs? Me too, so I thought I would offer what we call product shares for the first time this year. You can join one, some, or all of the shares listed below, and you may order double shares if you wish. I would love to show you pictures, but Blogger is not great for showing a bunch of thumbnails together. You will receive a 6x6 piece of each of the 6 sheets in each pack. So this is a total of 84 6x6 pieces from 14 packs: Natural Composition (specialty), First Edition (specialty), Comfort Café, World Spectacular, Floral District, Storytime, Polka Dot Parade, International Bazaar, Be of Good Cheer, Birds of a Feather, Patio Party, Fan Fair, Summer Smooches, Twitterpated. 1/8 roll (approx. 1.15m of each colour) 8 colours – Always Artichoke, Baja Breeze, Cherry Cobbler, Crumb Cake, Daffodil Delight, Pool Party, Rose Red, Very Vanilla. 1/8 roll (approx. 1.15m of each colour) 10 colours – Basic Black, Cherry Cobbler, Chocolate Chip, Elegant Eggplant, Marina Mist, Melon Mambo, More Mustard, Old Olive, Pretty in Pink, Tangerine Tango. 1/8 roll (approx. 1.15m of each colour) 10 colours – Baja Breeze, Basic Black, Daffodil Delight, Early Espresso, Marina Mist, Old Olive, Pumpkin Pie, Real Red, Regal Rose, Very Vanilla. 1/8 roll (approx. 1.15m of each colour) 5 colours - Primrose Petals, Midnight Muse, Summer Starfruit, Gumball Green, Raspberry Ripple. 1/8 roll (approx. 1.15m of each colour) 5 colours – Calypso Coral, Island Indigo, Lucky Limeade, Pool Party, Wisteria Wonder. 1/8 roll (approx. 2.8m of each colour) 8 colours – Calypso Coral, Cherry Cobbler, Early Espresso, Island Indigo, Lucky Limeade, Pool Party, Whisper White, Wisteria Wonder. 1/8 roll (approx. 1.15m of each colour) 10 colours - Basic Grey, Pretty in Pink, Daffodil Delight, Real Red, Early Espresso, Rich Razzleberry, Night of Navy, Whisper White, Pacific Point, Wild Wasabi. 2 Flourish Designer Frames (silver) and 4 silver mini brads, 4 Designer buttons (brushed bronze), 4 Designer Ribbon Slides. 1/8 roll (approx. 1.15m of each, 8 lengths) - Striped Satin (black/grey), Cotton (natural), Sweater Trim (Cherry Cobbler, Gumball Green, Whisper White) , Scalloped Tulle (Cherry Cobbler, Crumb Cake, Early Espresso). Closing date to sign up for shares is Friday 19th October. I'll then place the order, sort and package and then post your share out to you or let you know it is ready to pick up (early November). Postage will be at Australia Post rates and is not included in the share price. Payment can be made in cash (in person only), Paypal or direct deposit. Email me with your Share selections, and to sort out payment. Important notice: These shares are for AUSTRALIAN RESIDENTS ONLY. I've just finished my card sample for a group I'm in where everyone creates a project and then shares the ideas with the group. The projects include cards, gift ideas and bags/tags/wrapping ideas for Christmas. Then in October we start sharing the ideas in our "12 weeks of Christmas", where each week you will receive an email containing an idea for a project, listing the supplies needed and instructions on how to make it. I won't be sharing any of the ideas on the blog, it will only be available to my newsletter subscribers. If you are not on my mailing list yet, you will miss out. Last year was the first time I did this and it was a hit. So what are you waiting for? Sign up for my newsletter mailing list today so you don't miss any of the great ideas! Another simple and elegant card by Tamara. Here she's used the Holiday Frame embossing folder on the front of the card, and inside used a couple of the framelits dies, one from the Bitty Banners set, and the other from the Apothecary Accents set. She's used the coordinations cardstock for the card base, and sanded the embossing for a distressed effect, and added some glitter as well. I hope that you've all been enjoying the gorgeousness of the Annual Catalogue. The Holiday Catalogue also went live on the 1st of September, but we thought we'd give you a couple of weeks to get into it before we bombarded you with the beautiful things the Holiday Catty brings!!! 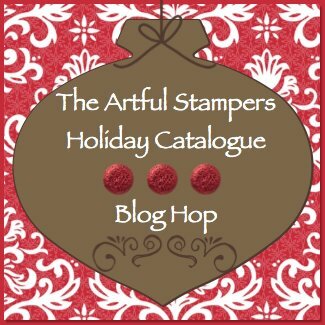 So another Artfull Stampers Hop ~ this time to celebrate the Holiday Catalogue Launch!! You may have hopped here from Karlie’s Blog. I’m stop # 10 on the Hop and I’m glad you're here sharing in the fun!! I have just learned how to make one of these cascading cards, and decided to use some of the paper and elements from the Merry Moments Simply Scrappin' kit. I added a few other bits and pieces as well. Now click on the link to Michelle's blog for the next stop on our Hop. I am sure you will find lots of wonderful ideas there to inspire you. And in case you get lost or there are broken links just pop back here for the full list of stampers taking part in this hop. Don't forget to leave comment love as you trip along the hop from blog to blog. We like to know what you think about the things we've been doing!! This is the project that everyone who came to my Catalogue launch party weekend made. It's a little pouch you put a packet of hot chocolate in, and would make a nice gift for someone. I got the idea from a US demonstrator by the name of Dawn, and adapted the size for our cardstock. I ended up putting real red narrow taffeta ribbon through the holes to tie it together. I've used the Scentsational Season stamp set and matching Holiday Frames framlits, and one of the Window Frames framelits to make the mat for the cup. Everyone enjoyed making these, and it was suitable for beginners and experienced stampers to make. There's still more work to be done, it will take a while. I've been busy in the studio getting ready for this weekend's new catalogue launch party. Here's a sneak peak at the make and take. I'm looking forward to the weekend, it should be fun! Jenny showed me this Christmas star ornament she made last week, which folds up to be posted in the mail. I can see lots of possibilities with this one, using Designer Series Paper, or stamping plain cardstock with different Christmas stamps. 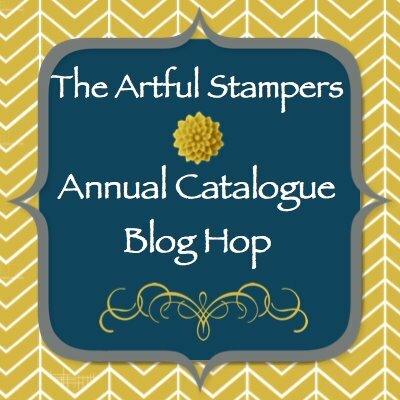 For those readers who are local to me in South Australia, I'll be having a New Catalogue Launch Party this weekend to celebrate the new Stampin Up Catalogues. I only have a limited supply of new catalogues on hand, so book early to reserve your copy. Come along and pick up your new Catalogues and Goody Bag of product samples, enjoy new product demonstrations and displays, and create a Make-and-Take project. While you are here, visit our Craft Garage Sale of discontinued Stampin Up products. If you're on my mailing list you should have received an email with the details, if you didn't receive the email and you would like to come along, please email me by September 5. It’s Stampin’ Up’s! New Annual Catalogue Time!!! 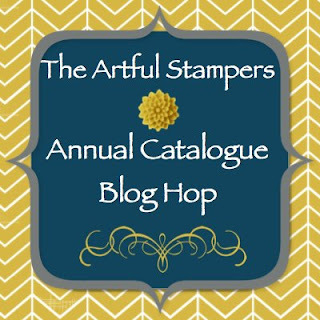 To celebrate, some of our Team – The Artfull Stampers – are sharing fabulous projects showcasing a selection of the gorgeous new products available in the 2012-2013 Catalogue!! You may have hopped here from Tamsin Adams’ Blog. I’m stop # 14 on the Hop and I’m glad you “hopped” in. I've created a card using the bold Betsy's Blossoms stamp set and a couple of the new In Colours. I also used the matching wheel to create a border at the bottom of the card using Versamark watermark ink - it's been a while since I've used Stampin Around Wheels! Accessories: Daffodil Delight 1/4" Stitched Grosgrain Ribbon, Paper Piercing Tool, Window Frames Collection Framelits Dies (129021) and Festive Paper Piercing Pack. 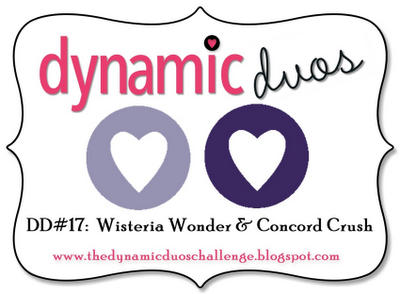 Now click on the link to Alisa Tilsner's blog for the next stop on our Hop. I am sure you will find lots of wonderful ideas there to inspire you. And in case you get lost or there are broken links just pop back here for the full list of stampers taking part in this hop.